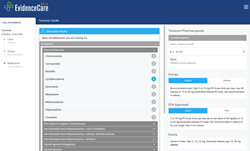 EvidenceCare, a Nashville-based decision support tool for healthcare providers, announces the integration of drug information from Tarascon Pharmacopoeia, the most popular and trusted source of portable drug information since 1987. EvidenceCare’s delivery is unlike anything we have seen. We are excited about bringing our content to a new audience in a fresh way. Tarascon Publishing, an imprint of Jones & Bartlett Learning, publishes pocket guides that succinctly distill and organize hard-to-remember, yet vitally important clinical information. Tarascon content is available within every EvidenceCare pathway, clearly identified by the company’s logo. Combining that content with the innovative delivery mechanism created by Fengler provides a refreshing context for acclaimed Tarascon resources. EvidenceCare was pioneered by Fengler, an emergency room physician, and offers a unique dashboard interface that presents treatment recommendations based on the unique factors of each specific patient. Providers of all types appreciate the ease-of-use and the fact that it works the way they do, in line with their workflow. The solution is available anywhere there is an internet connection and doesn’t require IT resources to get rolling. EvidenceCare launched nation-wide earlier this month with pathways for the conditions seen most by providers, a comprehensive Antibiotic Guide which incorporates Tarascon data, an independent Tarascon Pharmacopoeia Guide, and a USPSTF Guide. Pathway content has been developed by industry-leading experts and is curated specifically for each patient. The company offers subscription models for physicians, mid-levels and nurses, ranging from an ad-supported free version to subscription options that include a patient presentation feature, documentation packaging for any EHR with a single click, and CME credit for the time a provider spends working in the tool. In addition, the company offers integrated enterprise solutions for health systems and hospitals. Providers can access the tool by visiting http://www.evidence.care.